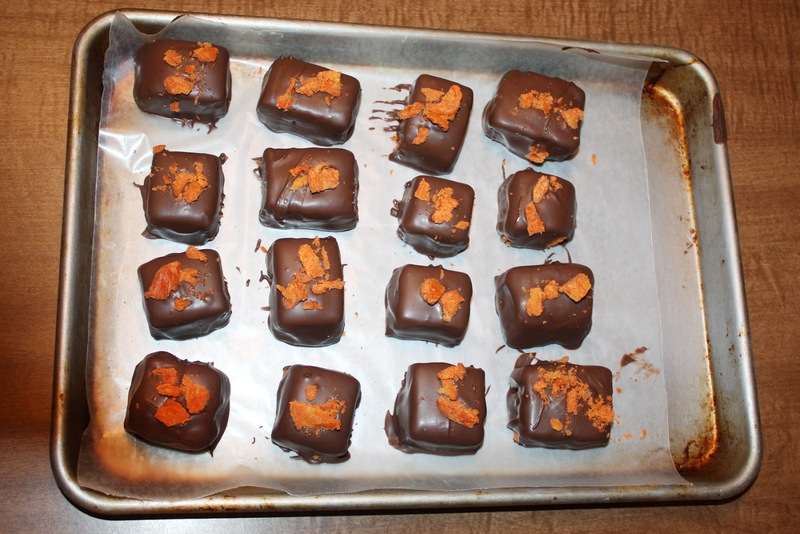 With the abundance of candy corn in stores these days I’ve been itching to make some homemade butterfingers. I found this recipe on pinterest maybe six months ago and immediately had to try it out. 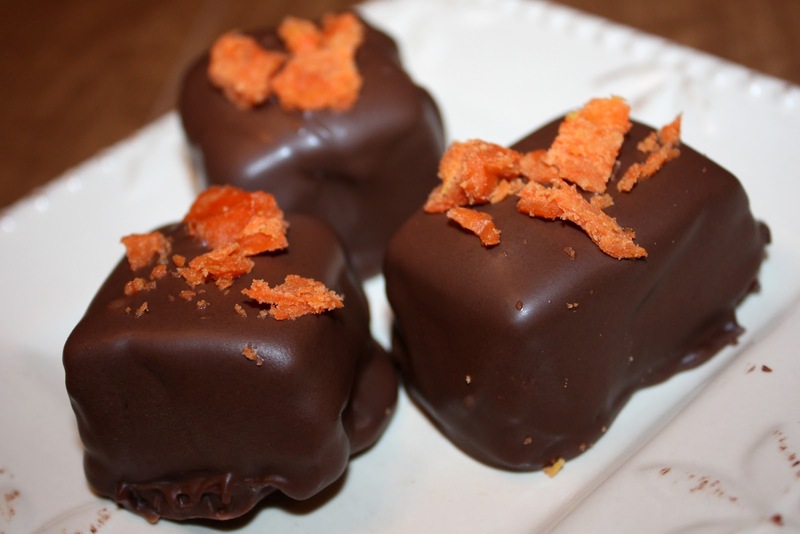 It’s pretty easy and the taste is almost spot on to a regular Butterfinger. My first batch turned out very ugly, though, and I wanted to pretty them up a little this time around. The recipe is definitely simple enough. Mix one pound of candy corn with one 16 oz. jar of creamy peanut butter. You’re supposed to microwave them together stirring every thirty seconds or so. But I found you get a lot of burns that way! So this time I did it on the stove and it seemed a lot simpler. 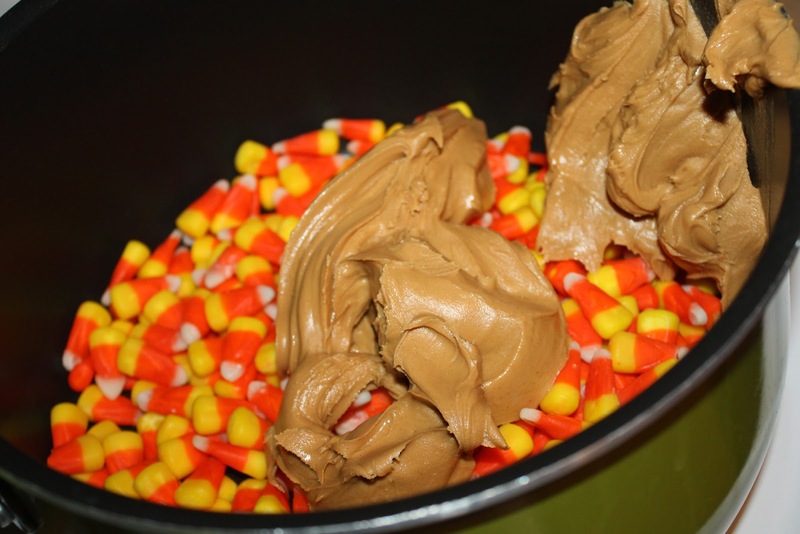 This mixture is extremely thick and you really need your muscles to get the candy corn fully incorporated into the peanut butter. I let Caden give it a shot, but he gave up after a few seconds. 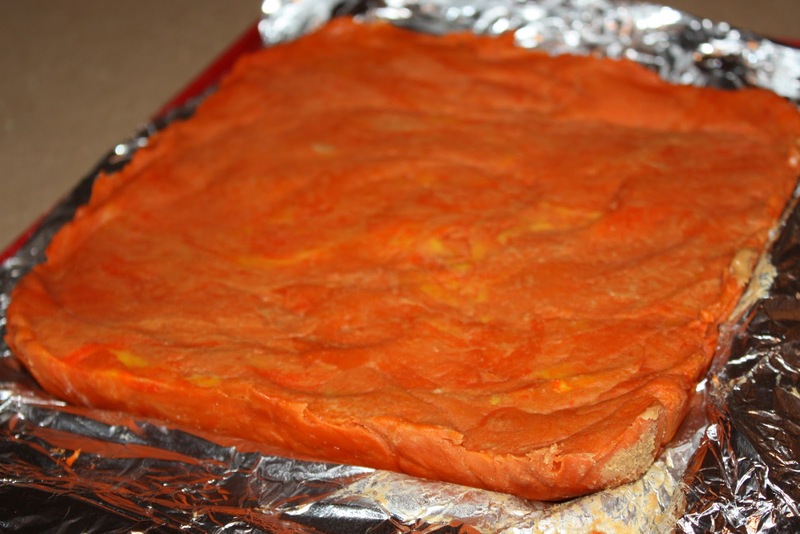 Next you press the mixture into a foil lined square pan and let it harden. I popped it in the freezer for about fifteen minutes because I was in a rush to get them done. 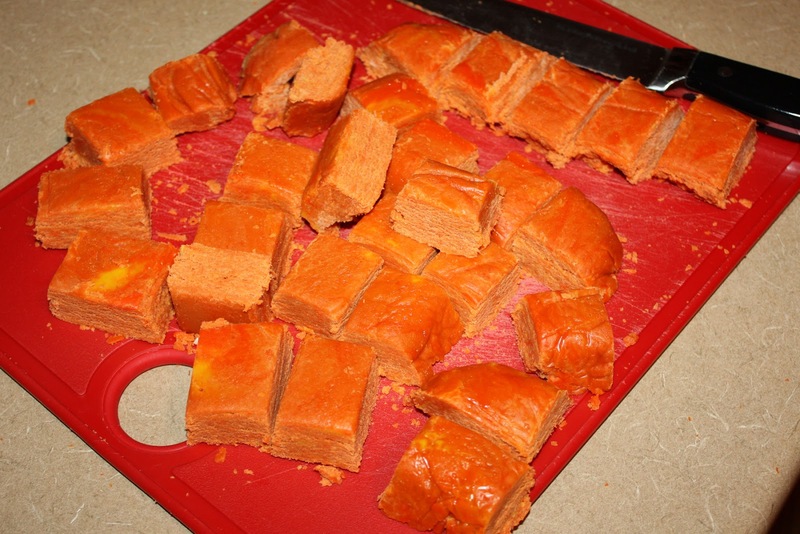 Next, cut them into however big of pieces you want. They’re not too pretty to look at yet. And finally, dip them in some melted chocolate and let harden! You can use any type of chocolate you want. If you go with almond bark, which I did, they’ll look a lot prettier. If you use regular chocolate you won’t get that super smooth finish, but they’ll taste better. I chopped up one of my squares to sprinkle across the tops and make them look like fancy chocolates. 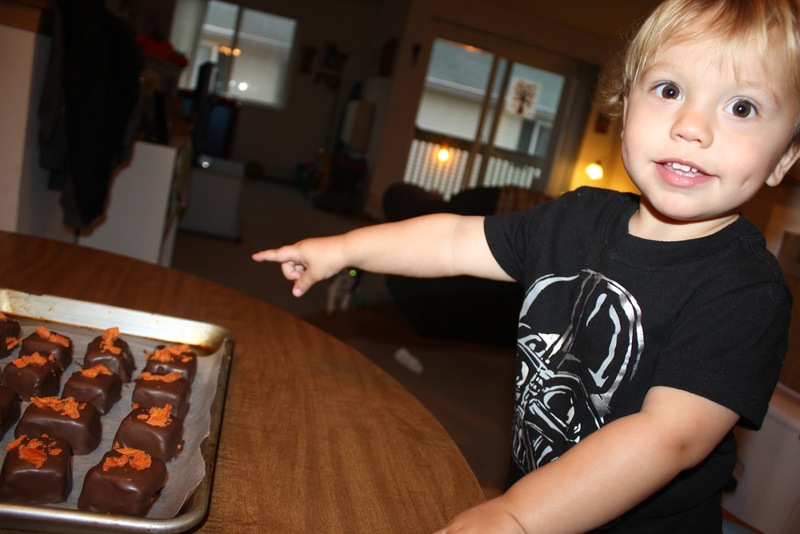 And that’s how you make homemade butterfingers! I think they’re pretty delicious, but if you eat more than one at a time you’ll probably have a stomachache. 🙂 I have a hard time stopping at one. In other news…my weekly weigh-in. I don’t even want to say this, which is why I’m hiding it at the end of a dessert blog. I gained 3.2 pounds this week. I didn’t even try to stick to my plan this week. While I was in DC last weekend I did about five times more walking each day than I do regularly, so I figured I was safe to go a little overboard with eating. Well…I shouldn’t have. Enough said, right? Of course it didn’t help that I was in a major mood to bake. Rainy, cold weather does that to me. 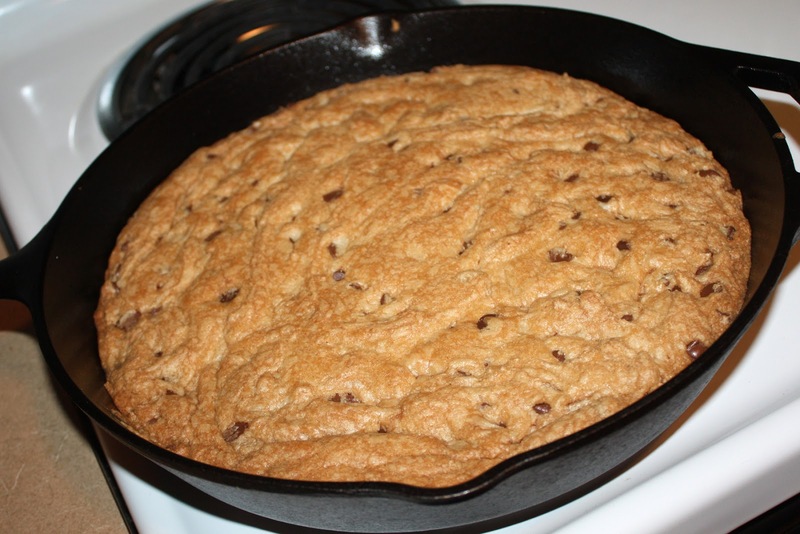 On Monday I made this delicious brown butter skillet cookie. On Tuesday I made pretzel buns. On Wednesday I bought spinach dip and ate way too much. 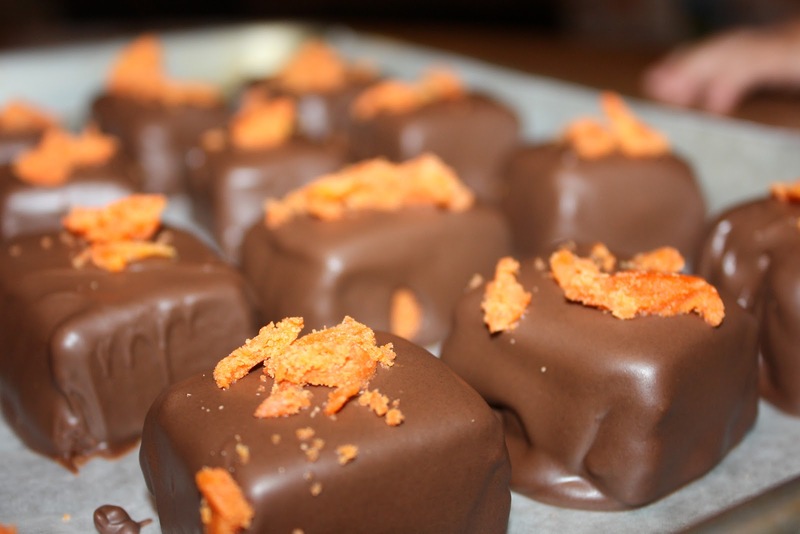 On Thursday I made butterfingers. So yeah, it’s really no surprise I gained weight. I didn’t limit my portions, I didn’t track what I was eating, and I didn’t do a whole lot of exercising after the weekend. I’m mad at myself and my lack of control, but I’m also mad about how I’m feeling about my weight loss journey these days. Like my entire self worth is based on what the scale is going to say on Friday morning. I really have no confidence that I’m going to lose more than the ten pounds I’ve been hanging around the last few weeks. So I’m sort of self-sabotaging myself by no longer trying very hard. And like I said at the beginning of this weight watcher’s journey – I never wanted to be one of those people that constantly said no to food. 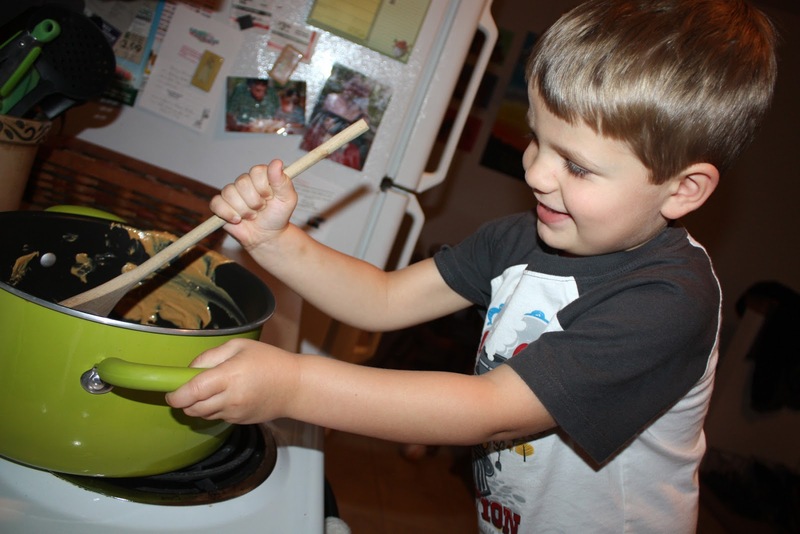 I still feel like food is meant to be enjoyed, especially when I find so much joy in making it. It’s been pretty easy for me to cut back on snack foods and quick restaurant stops for lunch. But giving up baking? I just can’t do it. Anyway, those are my very mixed feelings about weight loss this week. Clearly, I’d love to keep losing weight. But I’m not sure that goal really outweighs any of my desire to enjoy the foods I can make. Finding a balance is proving to be more difficult than I can manage most days. It’s frustrating. And tiring. But I suppose I just have to keep pushing through it. A lifetime of better decisions, mostly eating the food I like in moderation, should hopefully pay off in the long run. I just have to keep making the right decision. Which is sometimes so hard.